Now you can add even more value to your MarketWatch Newsletter by including your personalized Local Market Activity Chart. Each month you can supply your clients and potential clients with the information they want and need about the local housing market. Simply include the local market stats in the following categories for each of the areas in your sales territory (six maximum) when you send your newsletter order each month. Click on Image for enlarge view. 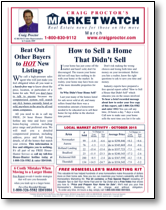 For only an additional $25.00 per issue and just a few minutes of your time, you can increase the impact your MartketWatch newsletter has on your readers. There are 24 different versions of this newsletter for your prospects, allowing you to automatically follow-up month after month. To get started just click the newsletter samples above to being the process for your monthly newsletter.